who so desire can wear,"
tiveness of the Israeli army." not the primaries for Lt.
the race against State Sen.
Israeli aircraft returned safely to their bases, the spokesman said. Abrams. The Floridian regrets the error. A cocktail reception was held recently at the home of Dr.
School BarMitzvah celebration will appear in the April 11 issue. MONDAY, MAY 5, 1986 7:30 P.M.
Mr. and Mrs. Merrill Bank sitting with Benjamin S.
year plan authored by U.S.
world with a clear picture of who these people are today. Center, 18900 NE 25 Ave., North Miami Beach, Fla.
move to rectify the problems. period) to the Women's Division Project Renewal campaign. HaSharon, Palm Beach County's Project Renewal "twin"
day, April 17 at 11 a.m. at the home of Mrs. Eugene J. Women's Division director, at 832-2120. THURSDAY APRIL 24 6:00 P.
deny the fact that our major problem is the destruction of Israel. terests. The individual Israeli and Israel's institutions." based on plunder and terror." another quarterly installment of $28.9 million. moral support to rejectionists of every stripe. They should not be rewarded. Combining Out Vim anil f*ltM jn.in Rei'O'lr"
Advertising Oi'tcio- Sue Lesser Phone MUM? serve the drive to power. Jo middle clasi "ethnic' Herut leadership. to go back into the water ..."
still horror films about them. a base for attacks on Israel. for every young girl and boy." even a limited provocation . danger of war would grow." Speaking in Ashdod on Mar. party does not choose me." speak, if at all, with restraint. busy slugging it out in public. for the state of New York, is this week's guest. show features Israeli and Yiddish music and humor. 12 (8:30 a.m. WFLX-TV 29) with host Richard Peritz. NIANS" Wednesday, April 9, 8 p.m. WXEL-TV 42.
mentaries by experts on the issue. Community Center Annual Meeting 7:30 p.m.
Ezrat 12:30 p.m. B'nai B'rith No. 2939 7:30 p.m.
Jewish Federation Campaign Evaluation 7:30 p.m.
Sisterhood Hadassah Yovel board 9:30 a.m.
Hadassah Bat Gurion board 9:30 a.m. B'nai B'rith No. 3196 Temple Beth David Sisterhood board 8 p.m.
Club American Jewish Congress 12:30 p.m.
the purchase of "call options"
of the call option by one dollar. Fund while at $83 a share. them with our own threats. for Pesach for all Israelis. boycott of the State of Israel,"
Jewish attachment to the soil. cheaper ways to eat out. Jews because they are Jews." the U.S.A. and Saudi Arabia." the birth of President Harry S.
the crap and let's talk sense." despair. Do not abandon them! That is why they killed him. None of that seems likely. Person to assist as all-around office helper. own transportation for pickups and deliveries. 9-5, 5 days. Excellent benefits. Meyer Famd, Martha Kodish, Anna Ettleman and Carol Fox. the Jewish Family and Children's Servicce. UNIVf ttAI KOSHER TOUtS INC.
Shlomo StiHerman was the "" "
PLANNED ACTIVITIES / Breakfast. Lunch and Dinner. a National Priority," was Dr.
directed by Dr. Eugene J.
of G-d and the human person." religious schools of our nation. in a concert benefitting the Center. May 13 film will be announced. children who attend the public schools for Friday, April 18. For complete information, please call 689-7700.
plus one's own fare. Hersh Rubinson is host for this event. Lantana Rd. just east of Congress Ave. on the south side. Call Ann at 689-7700 for additional information. day, April 11 at 9:30 p.m. at the home of Doug Barr. Call Ann at 689-7700 for directions. Roslyn Chudow and Judy Weintrob. Bressler will help allto avoid the slipping and sliding. will meet at Mim Levinson's at 7:30 p.m., Sunday, April 13.
happy to greet all who attend. pieces in a cabaret setting. ching" and enjoying of non-Passover treats. Ann at 689-7700 or 622-9139 to RSVP and for directions. tivism at the highest levels." ed our political friends in Washington." and security is in the best interest of the United States. to the next Washington trip." of Passover in the year 1135.
trait on June 17, 1985. Bernstein. Collation courtesy of Mr. and Mrs. Sam Heller. Sholom, 315 North "A" Street, Lake Worth. Michael D.
on "Tax Considerations In Retirement." round trip. For more information call Sylvia Terry. Clubhouse, 544 NE 22nd Ave., Boynton Beach at 1 p.m.
scheduled for Monday, April 14 at Anshei Sholom at 1 p.m.
(next to travel agency), 4645 Gun Club Road West. Family." Refreshments will be served. a.m. in the Sunrise Bank. April 11-14 Spa trip to the Regency Hotel in Miami. all proceeds will go to Youth Activities. to Jews in the Diaspora. contact Martha Starr or Lillian Schack. (near Publix) on Sunday, April 13, from 9 a.m. to 3 p.m. Lakes Temple in Golden Lakes, West Palm Beach. and as a consultant to the Metropolitan Life Insurance Co.
Weft Palm Beach, FL 33415. April 10 at 12:30 p.m. at Anshei Sholom. Slides of "Israel"
will be shown. All are welcome. Queen. $25 includes bus, boatride and lunch on board. speak on the "Problems of Aging." at the Turnpike Holiday Inn. Entertainment. one quarter million dollar Israel Bond note. County Bond Organization, Thomas M.
the case known as Bender v.
enacted by Congress last year. come up before the Court. sky to study and teach at Technion. ing you up-to-date in your field." part of the program in English." research which will concretely assist Florida's citrus industry. Space Research, created by the ATS Chicago Chapter. rescheduled and coincided with the dinner. What's Next In The Middle East? posedly at war with Israel." to find the "legal structure"
on objectives if not on tactics. must be tactical, not strategic. stability in the Middle East,"
with proven track record of success. in Broward. Dade and Palm Beach Counties. as excited by what they see." tional programs. Call 689-7703 for further information. cising in a Light Way"
1:30 p.m. First Class April 11.
tion. Watch for new schedule. will be "at your service." available. There is no fee. May 1, the closing holidays. for us. We will miss all of you. passed on to his superiors. were not justified," he said. between two and 11 years. will be constantly on the road. Membe< ANA & Chamber of Cnmmeri . ceeded in escaping to the U.S.
at the Cornish Art Institute. riving here three months later. Shlyam, is on the faculty. two awards from the Ann S.
still remain in that country. dent of the Women's Division. to continue to focus upon. Ms.
"How can we accept that?" ticipate fully in American life? cept of a pluralistic society." 8:15 p.m., followed by an Oneg Shabbat. Mincha followed by Sholosh Suedos. Saturday 8:45 am. Rabbi Seymour Friedman. Phone 793-9122.
and holidays 9 a.m., Monday and Thursday 9 am. day 8:15 p.m.; Saturday 9 a.m.
evenings 8 p.m. and first Saturday of each month 10 a.m.
services 8:15 am. and 6:30 p.m.
TEQUESTA: 759 Parkway Street, Jupiter. Phone 747-1109. Rabbi Alfred L. Friedman. Services Friday 8 p.m.
17008, West Palm Beach, FL 38406. Friday services 8:16 p.m.
Susan Weiss. Sabbath services, Friday 8 p.m.
Okeechobee Blvd., West Palm Beach, FL 33409. Phone 471-1526.
there will be an Oneg Shabbat. You Trust The Media Today?" 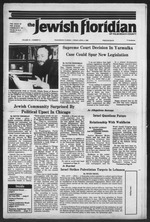 of services for Passover, 1986. Tov service at 10 a.m.
evening service at 8 p.m.
bat morning service at 10 a.m.
tions call the Temple office. Friday, April 4 at 8 p.m. at St.
morning, April 5 from 10 a.m.
No. 806, in West Palm Beach. civic needs of the community." them that they are one." Gardens Funeral Chapel. Deerfield Beach. Irvin, 67, of Hunters Run, Boynton Beach. Starting April 27th Em Am WUlBelaking Off Every Day ForTel Aviv.